13.3" allrounder with a good display. The new notebook manufacturer Hawkforce presents a solid subnotebook with a brilliant and bright 13.3" display in the Mobile.ForceM13.S1. Hawkforce would also like to put emphasis on high customer satisfaction and solid service after purchase. 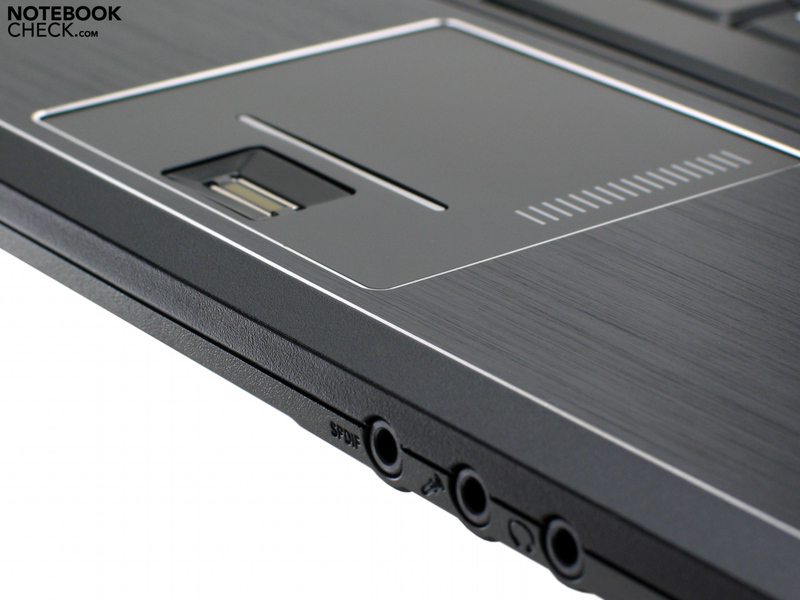 We took a closer look at the attractive 13.3" subnotebook Mobile.ForceM13.S1 by Hawkforce. Zepto's former "team Germany" now sails under their own flag called "HawkForce", and launches with an own built-to-order concept and a bulging online shop for individually configurable notebooks. The barebones are acquired by Hawkforce from reowned OMDs (original design manufacturers, per order manufacturers), such as Clevo and Compal, and then configured totally individually, according to customer preference. Quite a few notebook manufacturers of barebone-based devices have already quickly ceased to be in the customers' good books due to poor customer support and bad repair processing though. HawkForce thus would also like to put emphasis on high customer satisfaction and solid service after purchase. The Mobile.ForceM13.S1 by HawkForce comes in a compact 13.3" case with dimensions of 31.0 x 23.3 x 3.0 to 3.6 centimeters (width x depth x height), and a low weight of 1.93 kilograms. No flamboyant colors or gaudy ornaments dominate on HawkForce's subnotebook. The Mobile.ForceM13.S1's predominantly black looks plain. Only the small silver decorative strip at the lid's front edge can serve as an eycatcher when the lid is closed. The Mobile.ForceM13.S1 does suprise with a high-class palm rest made of brushed aluminium on the interior though. The Mobile.ForceM13.S1's display lid is very flat at only 7 millimeters. The display lid comes off pretty solid despite the flat construction of no more than 7 millimeters. We do not really have any complaints about our Mobile.ForceM13.S1 as far as the lid construction's tenderness and its inclination and tilting function are concerned. There are merely instantaneous image distortions if the LCD-frame is touched while the display is switched on. The thin lid is kept at bay through self-closing hinges, and the tumbler works solidly. However, the display cannot be tilted backwards up to 180 degrees, the limit is at about 130 degrees, which is a disadvantage for operation on a notebook-holder. The Hawkforce Mobile.ForceM13.S1's chassis presents itself torsion-resistant apart from that. We do not have any complaints about the Hawkforce Mobile.ForceM13.S1 regarding the accuracy of fit and the built quality. 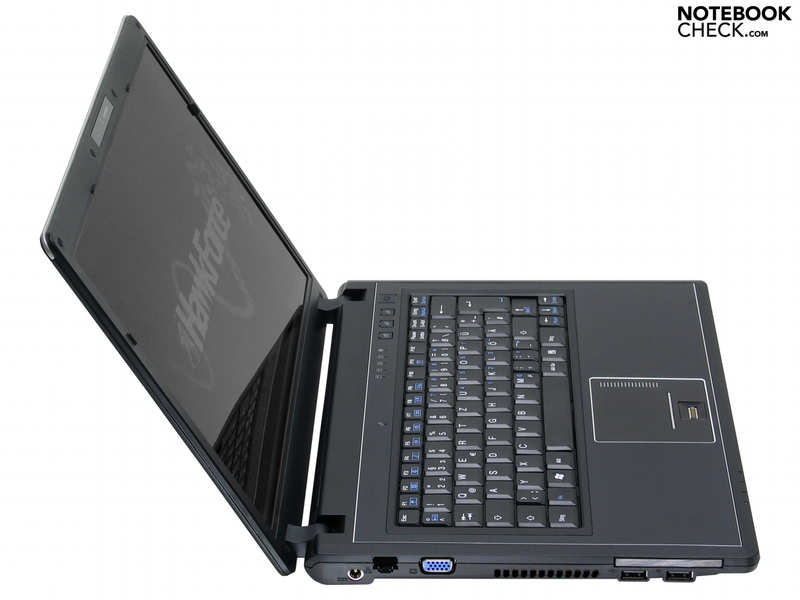 There are two large maintenance covers for trouble-free access to harddisk, system memory, and the additional modules on the Hawkforce Mobile.ForceM13.S1's bottom side, which is felicitous. A special highlight: the case's fan is mounted to the large maintenance cover and can thus be freed of dust childishly simple when the cover is removed. There are no surprises to be announced about the Hawkforce Mobile.ForceM13.S1's connectivity. The subnotebook features three USB 2.0 ports, an ExpressCard/54-slot, and a card reader for flash memory (MMC, MS, MS Pro, SD) . Moreover, the audio ports and a VGA-output are of course mandatory equipment. 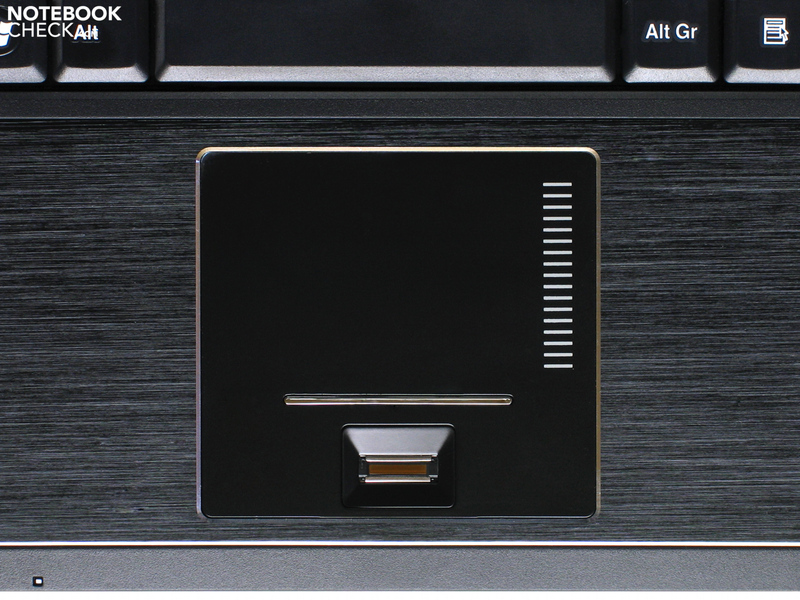 A fingerprint reader is aboard the Hawkforce Mobile.ForceM13.S1 as a special feature - the user can quasi login to the Windows desktop per fingerprint after setting it up. Our Mobile.ForceM13.S1 uses Intel's WiFi Link 5300 AGN for wireless communication. 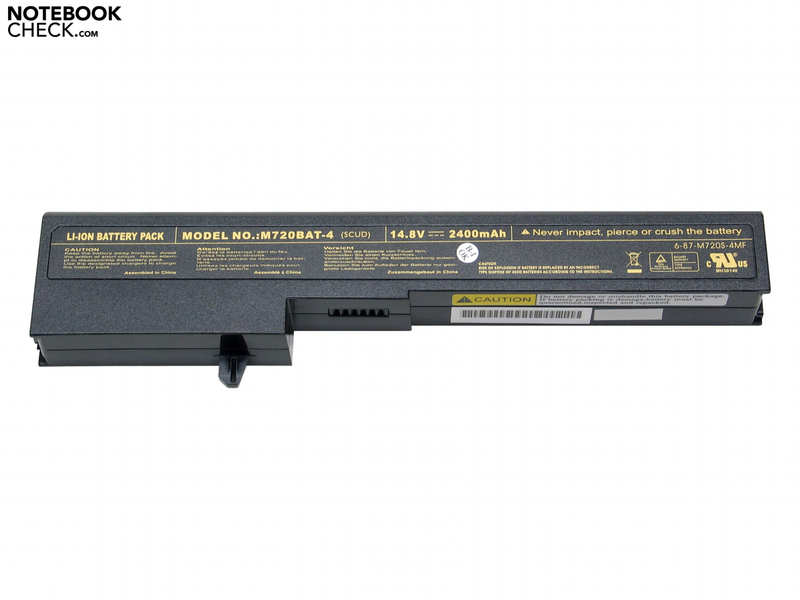 The customer can albeit also choose the cheaper 5100-module at Hawkforce. However, it cannot serve with an option for the broadband technology HSDPA (High Speed Downlink Packet Address). In return, a Bluetooth-option (28 Euros at the moment) is available when configuring the notebook. As far as wired communication is concerned, everything is aboard as well with fast Gigabit-LAN and an analog 56k-modem for enterprise or emergency communication. 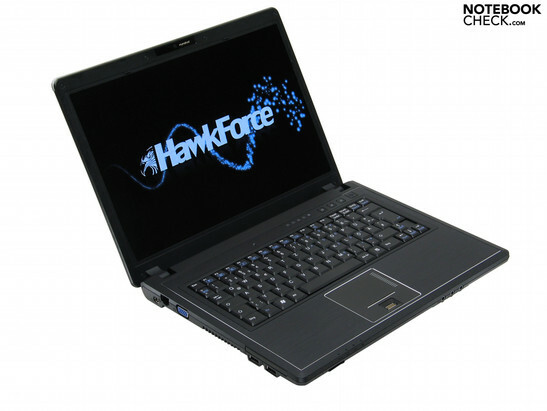 Hawkforce offers the Mobile.ForceM13.S1 without an operating system. The customer can draw on unlimited resources though, starting with Microsoft's Vista Home Basic (32 bit), including the Windows 7 Upgrade for 85 Euros, up to the Ultimate-version (64 bit) for 175 Euros. Hawkforce plays for keeps when it comes to warranty, the customers are thus offered a warranty of 24 months right away, including pickup and return. The warranty period can be extended to 36 months for an agio of 189 Euros. Hawkforce would like to offer a special and additional service to the customers with the "TechCheck": the device is picked up directly from the customer once per year, and is cleaned and checked thoroughly, starting at 99 Euros. 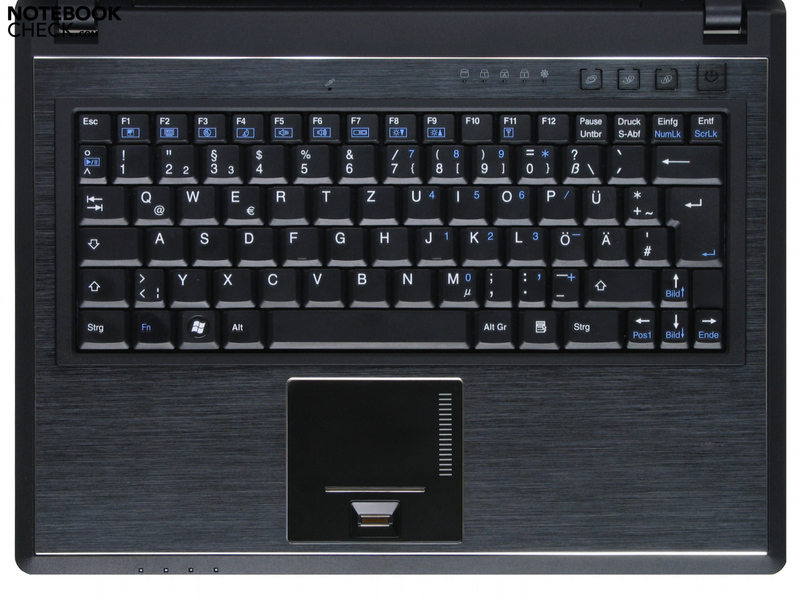 The Mobile.ForceM13.S1 features three special keys (hotkeys) on the right above the keyboard, through which the user can quickly access the standard email application, the preferred web browser, and the "silent-mode". Fan noise and power consumption are supposed to be decreased in "silent-mode". 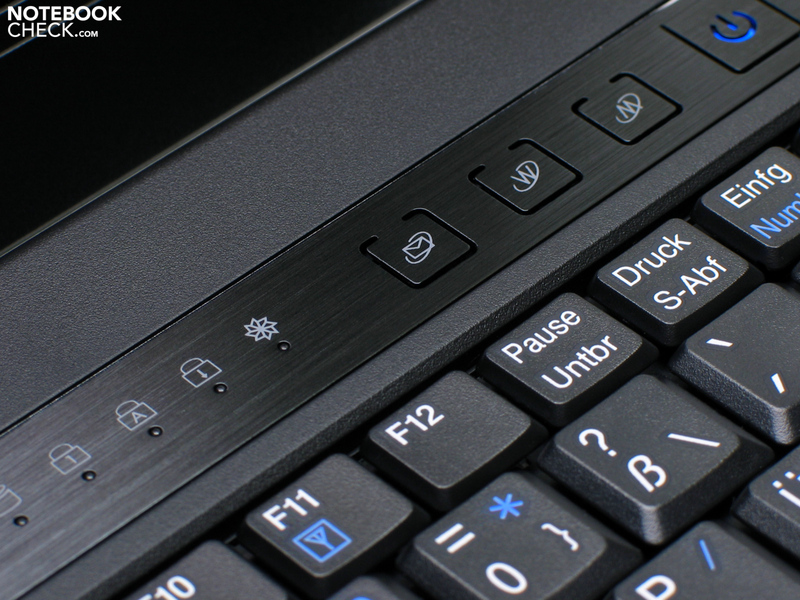 The LED-indicators are split up into two groups: the status-indicators are found on the upper right, next to the special keys, and show information about the keyboard, harddisk activity, and "silent-mode". Communication and power indicators are located on the front edge of the device's left side. Due to the small LEDs, the comfort of reading the status indicators suffers somewhat in bright office lighting. A matt black keyboard with 83 keys and a classic German keyboard layout is intregrated into the Mobile.ForceM13.S1 as an input device. The key's heads come off a bit smaller in terms of dimensions (effectively about 13 x 13 millimeters) than those of quite a few other manufacturer of subnotebooks. 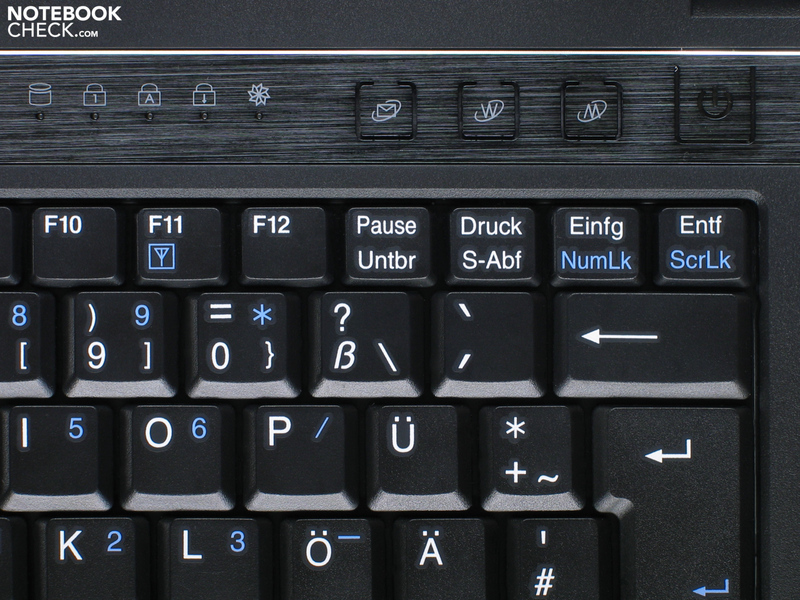 In turn, the "Enter"-key came off doublespaced. 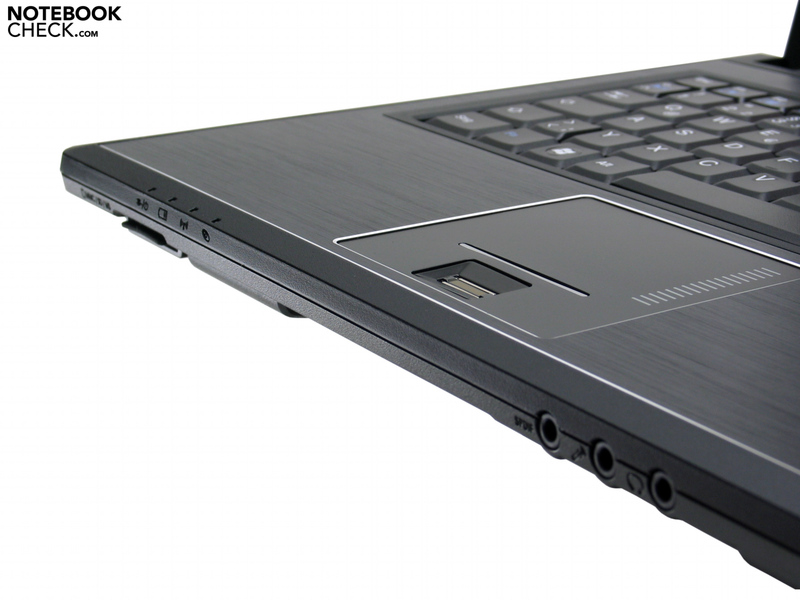 The Mobile.ForceM13.S1's notebook keyboard is certainly subject to personal taste as far as mechanics and feel are concerned. We found a comparatively long stroke, and a somewhat sluggish pressure point, compared to other devices of this class. 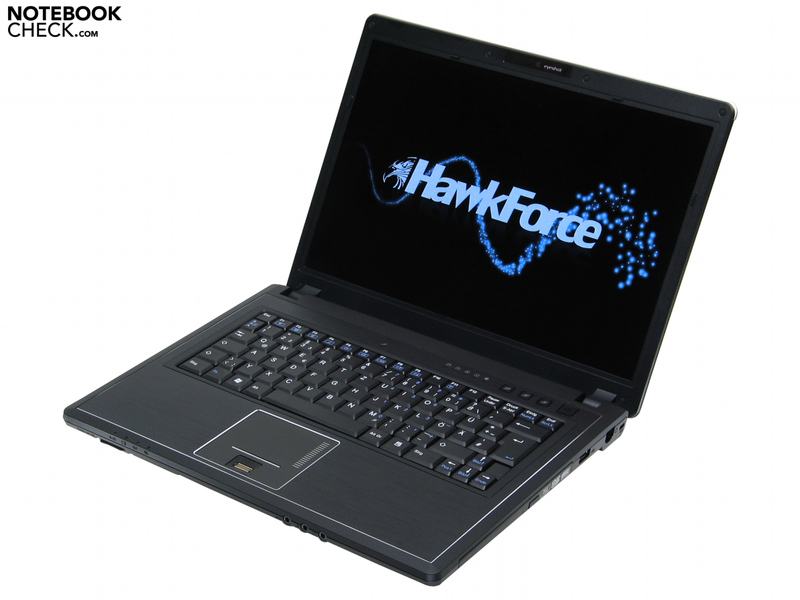 The Hawkforce Mobile.ForceM13.S1's touch pad places well in the class of 13.3" subnotebooks with its dimensions of 7.0 x 4.4 centimeters. It works precisely during the test, the surface albeit feels very slick in terms of haptic. Fancy: a small and palpable chrome bar separates the active navigation area from the fingerprint reader (integrated centrally on the bottom) and the two keys, both in look as well as feel. The triggering sound of the micro-switches (located below) is pleasingly silent. Ultra-flat LC-displays with LED-background-lighting are by no means still reserved for the wickedly expensive design-notebooks. Our Hawkforce Mobile.ForceM13.S1 also uses a 13.3" (33.78 centimeters) WXGA-display with power-saving LED-backlight. 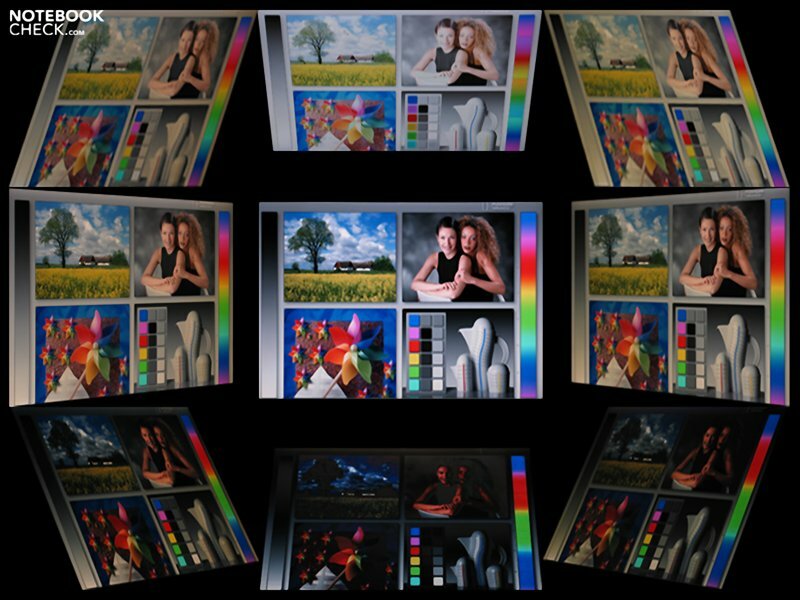 The reflecting notebook display features a maximum resolution of 1280 x 800 pixels. Our Mobile.ForceM13.S1 has a purple-tinted, glare-type coating, which leads to a less obviously perceivable direct dazzlement of the user by bright light sources. Nevertheless, a matt display would be more suited for outdoor usage. The medium luminance of the panel came off "very good" with 262.8 cd/m² for the Mobile.ForceM13.S1. Due to that, the very bright WXGA-panel is suited for outdoor usage as well, in spite of the reflecting display surface - if one finds a shady place for "browsing". The percentual deviance of brightness is very low with about 11%, the illumination is thus "very good" with 89 percent. Furthermore, the contrast of about 707:1 (! 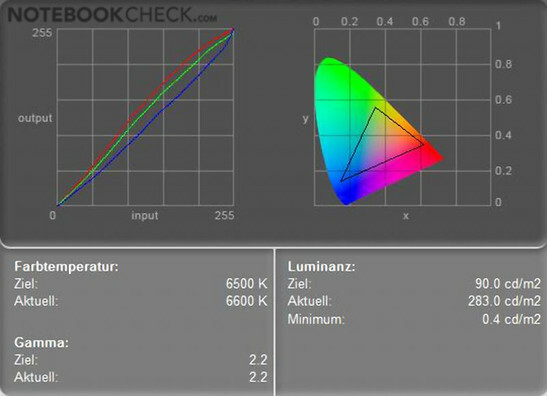 ), at a measured minimal brightness (black level) of 0.4 cd/m², is excellent for a notebook-LCD. Brilliance and contrast of the subnotebook-LCD are convincing, and the Mobile.ForceM13.S1's colors seem crisp - a successful presentation in the measurement laboratory. The Mobile.ForceM13.S1's display is brilliant, bright, and captivates with a balanced display of colors. We are looking forward to the direct comparison of view to our 20" reference Viewsonic VP2030b. Here, the Mobile.ForceM13.S1 pleases with a subjectively very brilliant, but not exaggeratedly "gaudy" display of the test images. The tones of skin of the portraits are also displayed quite naturally in comparison to the MVA-LCD Viewsonic VP2030b. We rated the possible angles of viewing as "good". On balance, the Hawkforce Mobile.ForceM13.S1 leaves behind a positive impression at the rating of the display, despite the reflecing panel. Our Hawkforce test device features an Intel Core 2 Duo T6400 with 2.00 GHz. The Mobile.ForceM13.S1's main processor is supported by a total of 2 GByte RAM. 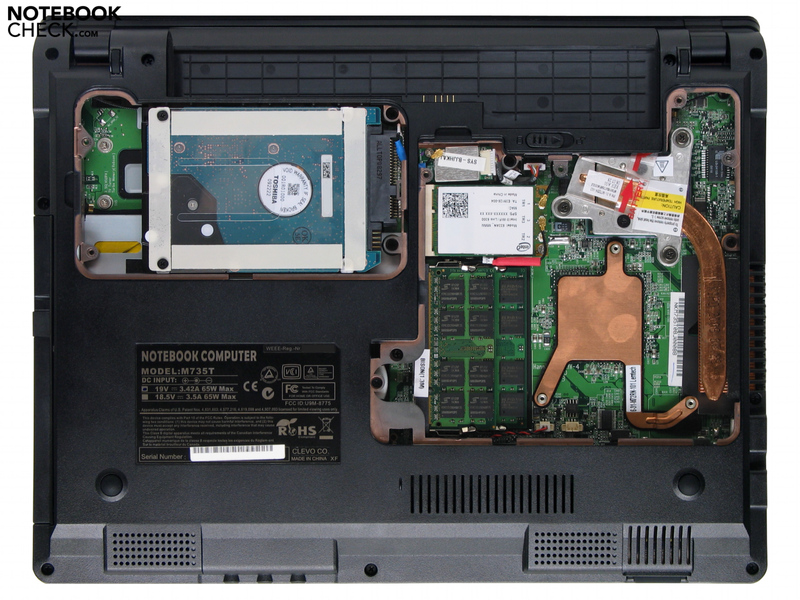 The two DDRII-800 RAM-bars each are 1 GB in size and occupy both RAM-slots at the case's bottom side. Hawkforce offers a total of 4 GByte for the Mobile.ForceM13.S1, but at least one of the modules has to go then. The customer can also choose a stronger processor as CPU for his Mobile.ForceM13.S1, from the quick P8700 (surcharge of 85 Euros) to the very fast T9600 (2.80 GHz) for 303 Euros. 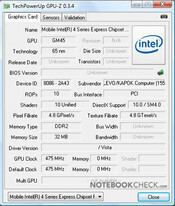 CPU-Z-Information of the Mobile.ForceM13.S1 subnotebook. 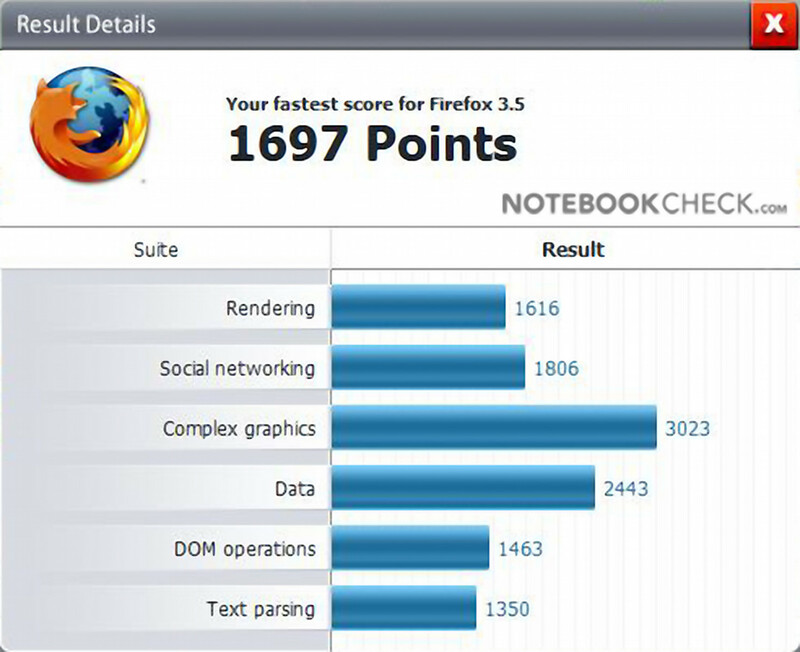 The Mobile.ForceM13.S1 already reached "good" results with the T6400 in the synthetic application benchmarks. 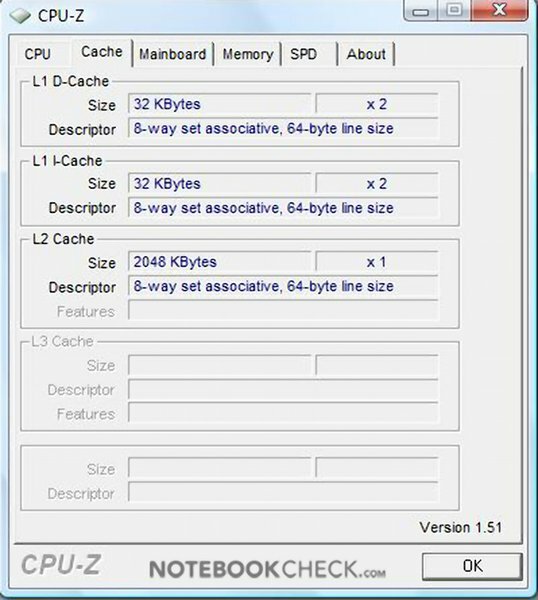 It at least reached 2154 CB-CPU in Maxon's Cinebench R10 "Rendering Single" test (one CPU-core), and the subnotebook by Hawkforce reached 4046 CB-CPU in the "Rendering Multiple CPUs". 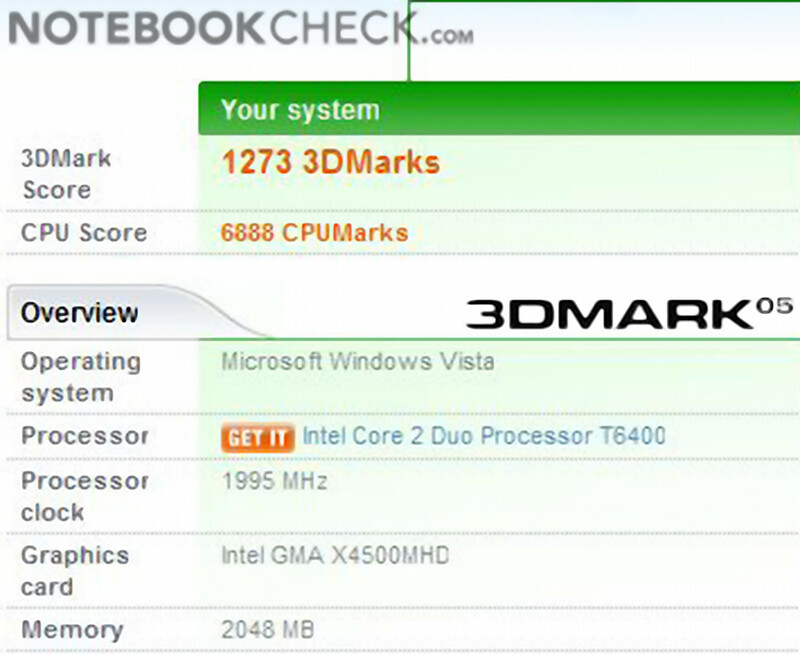 The application benchmark PCMark05 is also mastered by the subnotebook with 4479 points, and a rating of 81.4% ("good"). The Mobile.ForceM13.S1 even does a bit better in the more recent PCMark Vantage with3053 points (82.2%). 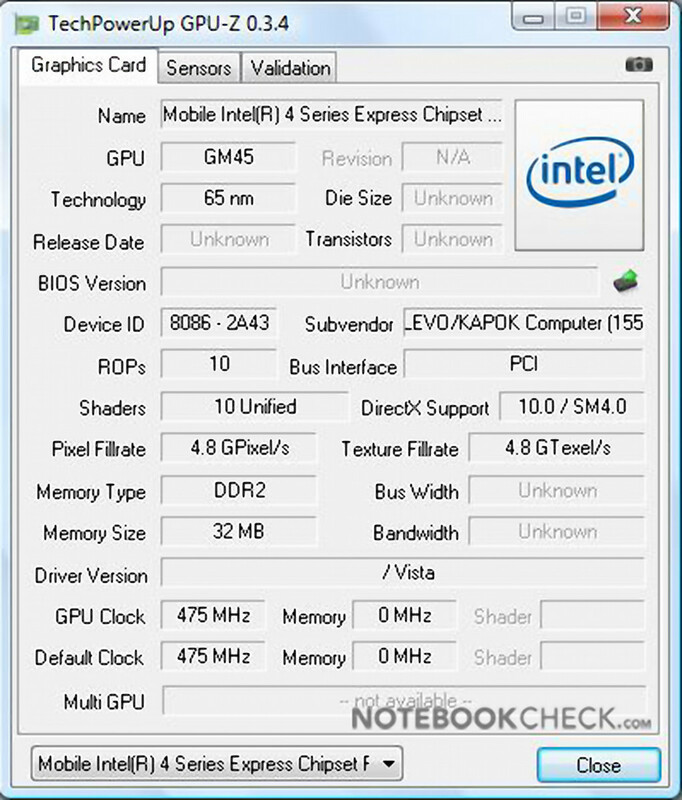 Intel's Mobile GM45 Express chipset (codename "Cantiga“; TDP 12 Watt) with integrated chipset graphics adapter GMA 4500MHD functions as technological subconstruction. The GMA 4500MHD is not really suited for current games with 3D-worlds rich in detail, low details and few graphical effects have to suffice for 3D-games most of the time. 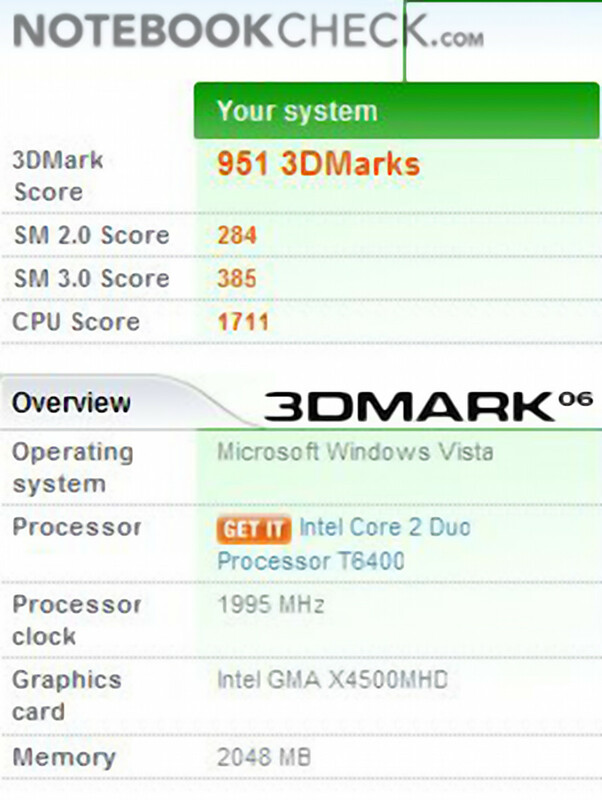 The value of 951 points (64.3%) in Futuremark's 3DMark06 supports this. In turn, the GMA 4500MHD offers integrated HD-support for Blu-ray with native, hardware-based decoding of HD-Videos (AVC, VC-1, MPEG). 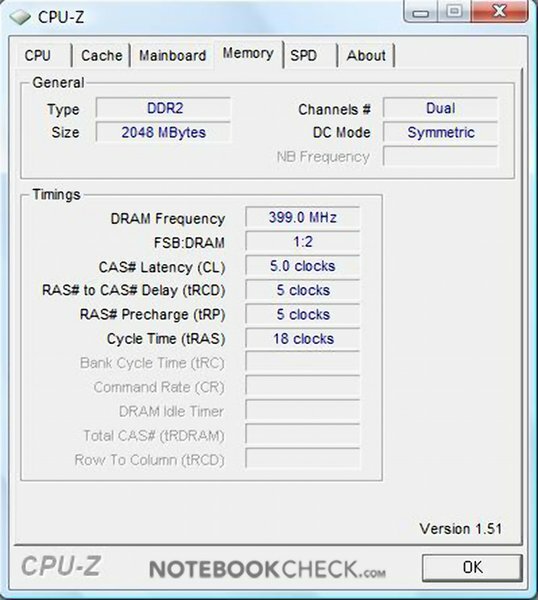 This very much relieves the main processor when playing HD-material, and the subnotebook thus does not have any problems with lagging when playing various HD-videos. Our Mobile.ForceM13.S1 features a 250 GByte SATA-harddisk (HDD), a MK2555GSX from Toshiba, which works at rotation speed of 5400 rpm. 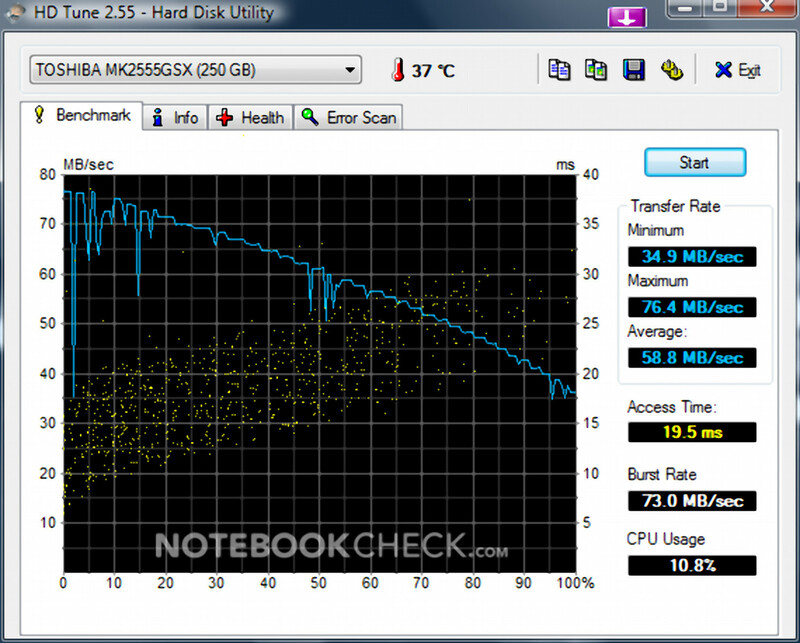 The MK2555GSX reaches an average transfer rate of 58.8 MB/s in HDTune and places itself in the upper third among comparable 250 GByte HDDs. 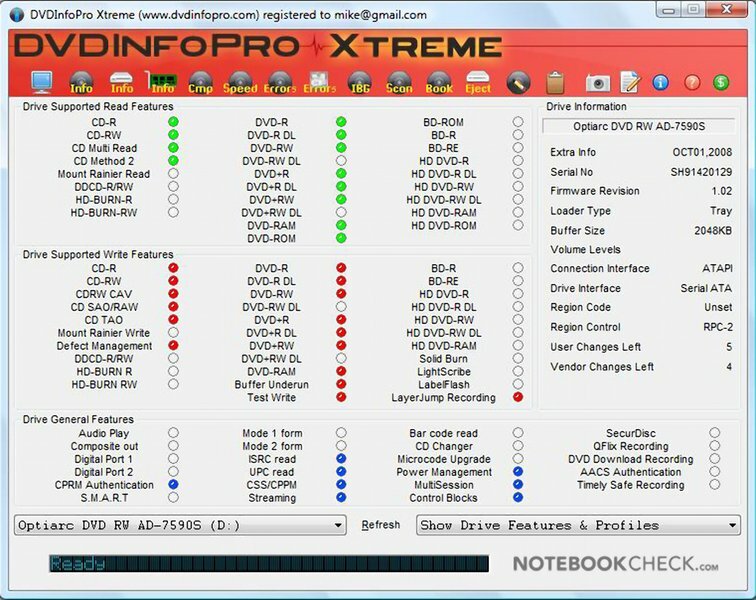 An integrated optical drive is often missing in quite a few subnotebooks by now, due to lack of space, or in order to save weight. Our Mobile.ForceM13.S1 by contrast features a DVD-writer AD-7590 by Optiarc (Sony NEC Optiarc Inc.), which can also write to DVD-RAM media (5x) for archiving data. Until now, games were certainly not among the key disciplines of subnotebooks. The compact and light-weight companions are rather supposed to offer long battery life instead of brute performance. Thus, the message in this class is to save power. The Mobile.ForceM13.S1 does feature up-to-date hardware with the GMA 4500MHD chipset graphics adapter. However, the GMA 4500MHD's computing performance is only sufficient for older or less demanding games in lower screen resolutions. This is also apparent from our article 'Which games run fluently on notebook graphics cards'. 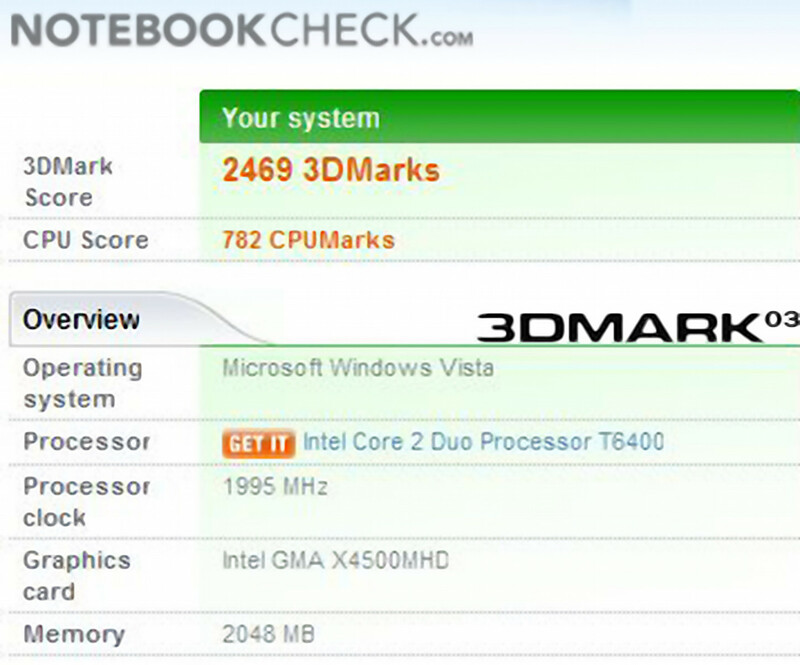 The GMA 4500MHD also reaches only 2469 points in 3DMark03. 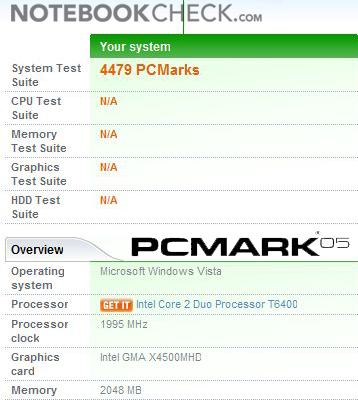 Altogether, the GMA 4500MHD reached a "D" with 61% in the benchmark tests of the Futuremark-series. The Mobile.ForceM13.S1 finally does have to shed some feathers when measuring the sound pressure level. The Hawkforces's fan clearly works more noisily, compared to other test candidates of the 13.3" class, both in idle-mode, as well as under load. Paradoxical: if we switch from idle-mode and energy saving mode (everything switched off) to "silent-mode" via hotkey, the fan operates in slow "continuous operation" at 32.9 dB(A). However, if we switch to "normal operating mode", the small rotating wing totally rests as well, we then measure very quiet 29.8 dB(A) when reading documents. This does change from the "balanced" mode, 35.5 dB(A) are measured without the "silent-mode". We measure very loud 51.3 dB(A) under full load as maximum sound pressure level. The Mobile.ForceM13.S1 looses valuable points due to the 65% of the rating of the system noise, which are missing in the final rating in the end. The basic device's manufacturer, Clevo, could find a remedy here: a more harmoniously working control for the fan's behavior could be implemented via BIOS-update. We thus asked Hawkforce and got to know an interesting detail. The Mobile.ForceM13.S1 for instance is supposed to work a lot more silent with the P8600-CPU than with the T6400 featured in our test device. 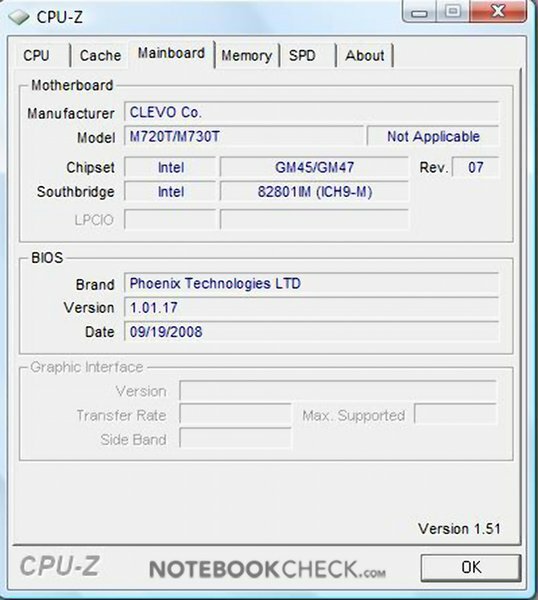 A BIOS-update itself is not yet available at the moment. Subnotebooks usually heat up a lot more than their more spacious desktop counterparts in continuous operation. The Mobile.ForceM13.S1 by Hawkforce however stays comparatively cool on the device's top side. We measure an average temperature of pleasantly cool 31.3 degrees Celsius at the top side, and the maximum of 34.7 degrees Celsius is still cleary within acceptable limits. The Mobile.ForceM13.S1 gets a little warmer on the bottom side with 34.1 degrees on average. We detect the area around the vent openings as the local heating maximum on the bottom side, we measure 43.3 degrees Celsius. Altogether, the Mobile.ForceM13.S1 with the T6400-CPU leaves behind a positive impression in the test regarding temperature. (+) The average temperature for the upper side under maximal load is 31.3 °C / 88 F, compared to the average of 30.7 °C / 87 F for the devices in the class Subnotebook. (+) The maximum temperature on the upper side is 34.7 °C / 94 F, compared to the average of 35.8 °C / 96 F, ranging from 22 to 57 °C for the class Subnotebook. The user should generally not expect a good quality of sound from the usually tiny loudspeakers of subnotebooks. 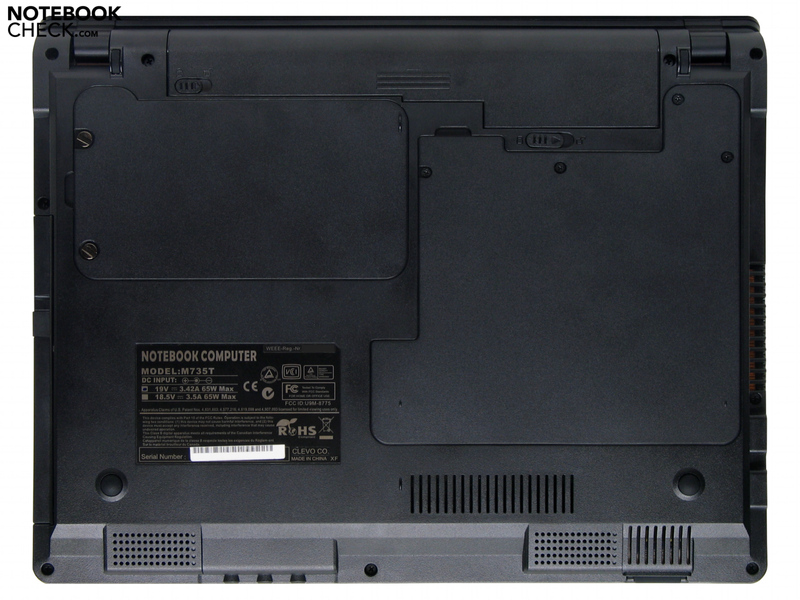 Two rowdies are integrated on the bottom side (towards the user) by the compact subnotebook Mobile.ForceM13.S1 as well. The sound is, as on many other subnotebooks as well, device-typically tinny and thin. Those who would like to enjoy more sound should better use the headphones jack. The Hawkforce Mobile.ForceM13.S1 offers a powerful audio-playback with our earphones reference Bose In-Ear Headphones. The compact subnotebook even features a S/PDIF-output for the digital connection to the home cinema equipment. When plugged into a power outlet, the Mobile.ForceM13.S1 by Hawkforce settles for 16.0 to a maximum of 21.0 Watt of power consumption in idle-mode. Those who are unwilling to pass on their fancy screen saver should plan on an increased demand of no less than ca. 5 Watt (!) for the graphical interlude. We then after all read up to 25.2 Watt (!) for the Mobile.ForceM13.S1 from our very precisely working energy meter. It is 31.0 Watt under medium load (Cinebench R10, one CPU-core). 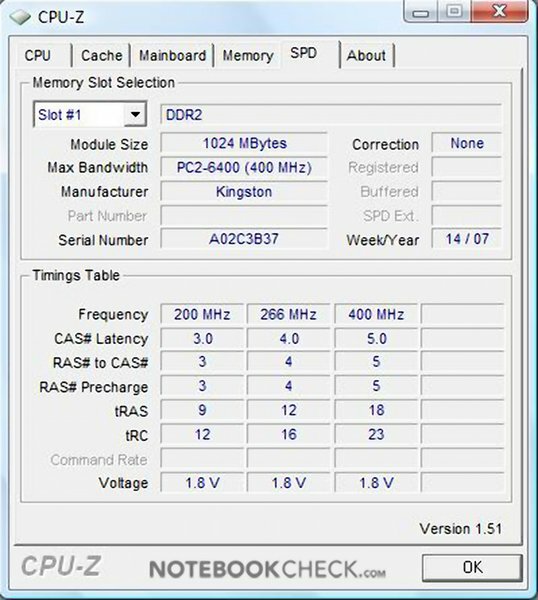 If we put full load on both processor and graphics adapter, we get a maximal power input of 45.1 Watt for the subnotebook by Hawkforce. Our Mobile.ForceM13.S1 includes a 4-cell battery with 2400 mAh ex factory. The subnotebook reaches a "satisfactory" battery life of 3 hours and 9 minutes in the Battery Eater Reader's battery test. The running time on battery then quickly does nosedive under more load in the Battery Eater Classic. On average, the battery is then drained after almost an hour - below average. 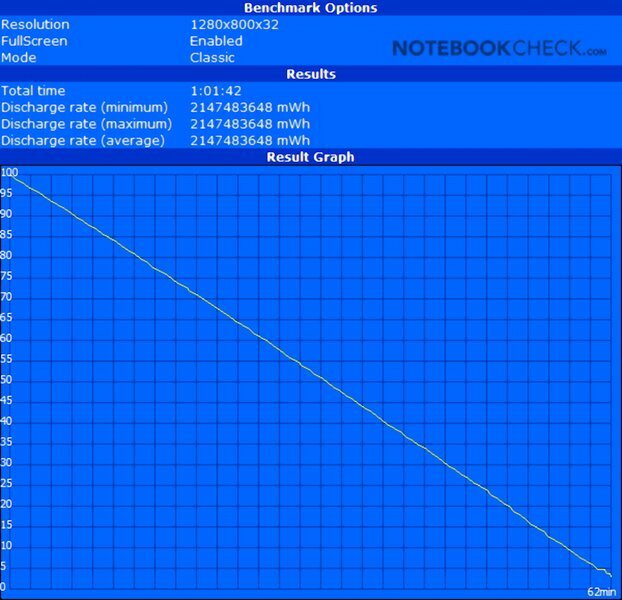 No stronger battery is optionally available for the subnotebook from Hawkforce either. Consolation: an additional battery only tips the scales at 226 grams. The additional investion for a battery life twice as long is also within acceptable limits at about 100 Euros. 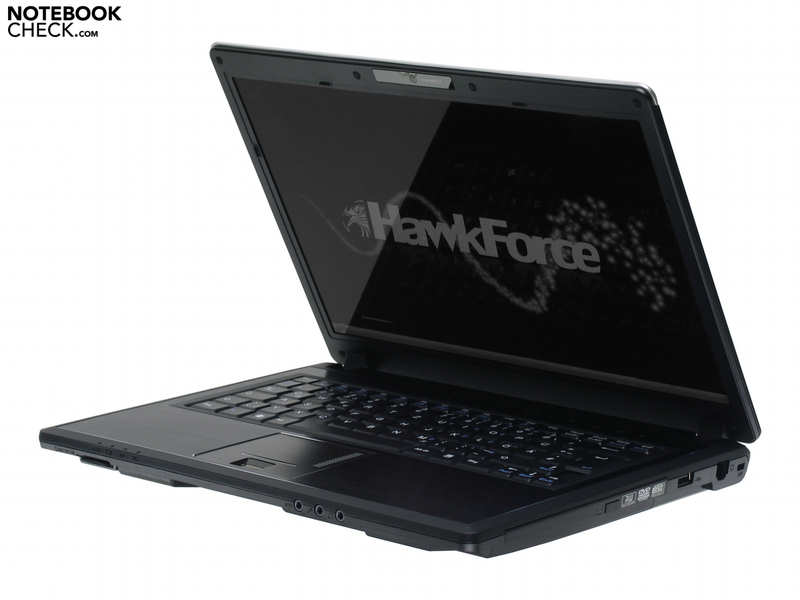 Hawkforce presents a consistently solid subnotebook with the Mobile.ForceM13.S1, with a good application performance and a bright and homogeneously illuminated 13.3" display. The compact dimensions and the weight of less than 2 kilograms actually predestine the Mobile.ForceM13.S1 as a portable travel companion. However, the battery life of maximally three hours is too stingy. 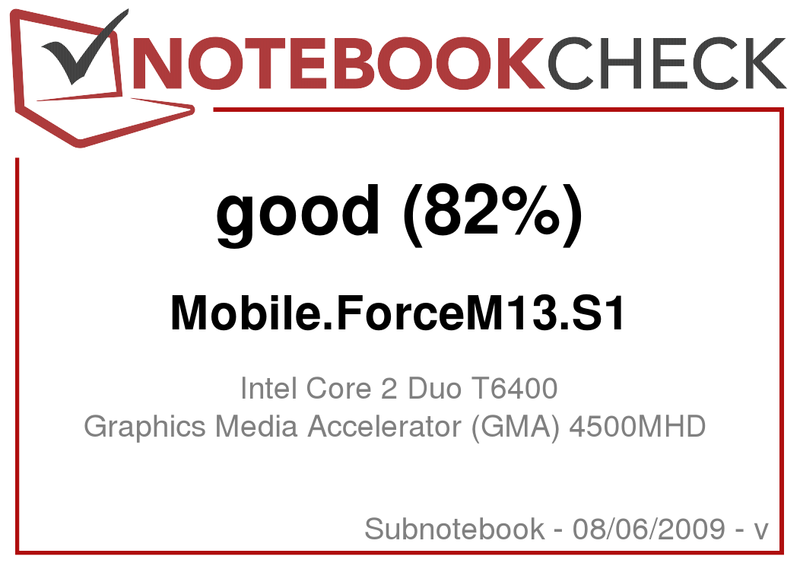 The Mobile.ForceM13.S1 by Hawkforce reaches the total grade 'good' in the test. The Mobile.ForceM13.S1 also reaches good results across the board as far as connectivity, the case, and input devices are concerned. When it comes to the accuracy of fit and built quality of chassis and mounting parts, there is also nothing to complain about on the Mobile.ForceM13.S1. The Hawkforce Mobile.ForceM13.S1 receives a 'B' (87 precent) for the brilliant and bright 13.3" WXGA display, in the end it only barely misses an 'A' due to the glare-type-coating. 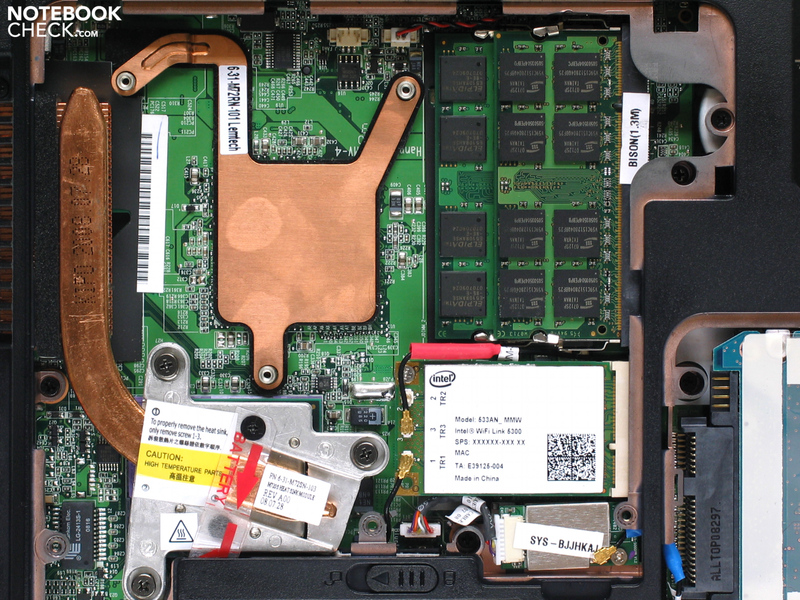 The available core components like CPU, system memory, and mass storage, offer a brisk basis for this notebook class. However, the Hawkforce Mobile.ForceM13.S1 does only recommend itself for mobile usage to a limited extent without a second battery, due to the scarce battery life of maximally three hours. In addition, the noise emissions of the subnotebook are nothing for sensitive ears. Positive: the Mobile.ForceM13.S1 integrates an optical drive and still remains under 2 kilograms. Those who are looking for a low-weight subnotebook, but do not mind a bright and brilliant yet reflecting display, get a solid 13.3" format notebook with the subnotebook by Hawkforce. The Mobile.ForceM13.S1 is available from about 579 Euros in Hawkforce's online shop at the moment, and can be configured individually. 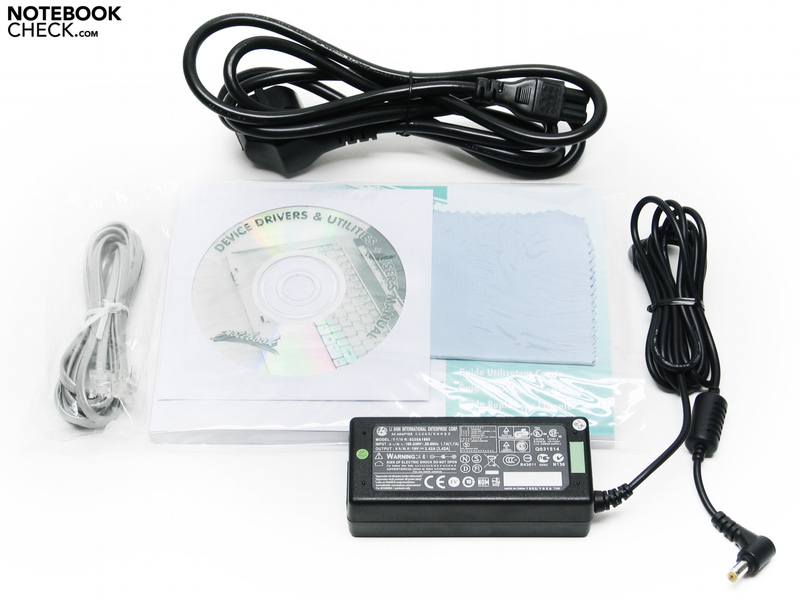 The accessories included with the Hawkforce Mobile.ForceM13.S1 comprise a modem cable, a driver CD, a micro fibre cloth for the display, a German manual, and the mandatory power supply unit. 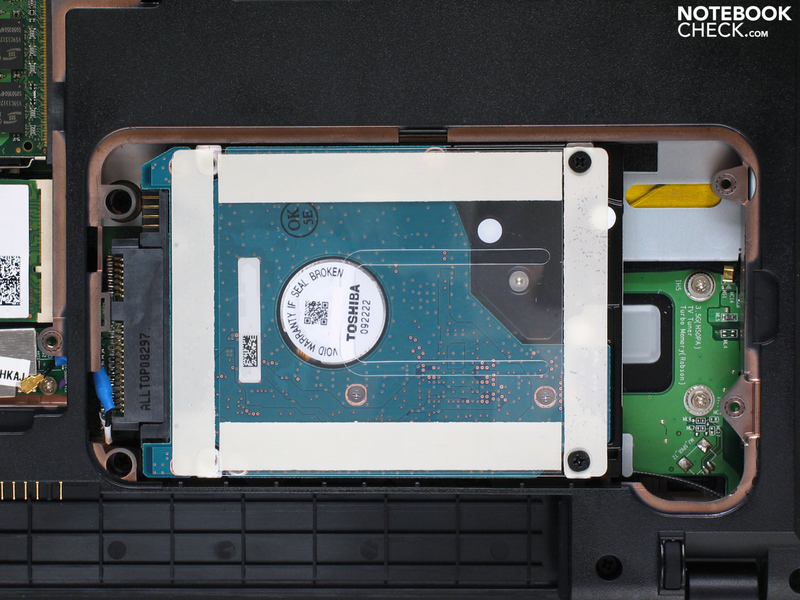 The harddisk is also accessible without hazardous dislocations. No matter if the RAM-modules are to be exchanged or if another WLAN-module is to be installed a posteriori - such tasks are done in no time at all with the Mobile.ForceM13.S1. 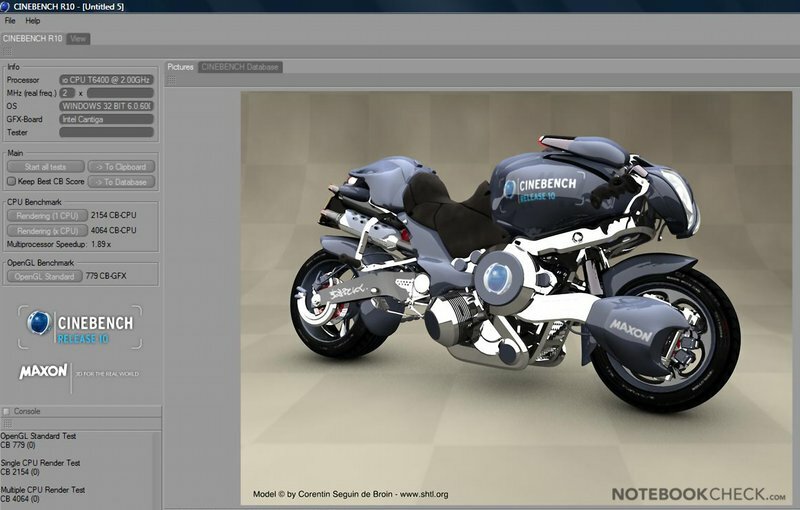 Access to the core components is very easily possible with the Mobile.ForceM13.S1. The fan could use a dedusting cure after a couple of months of hitting the road with the notebook and racing through dust-ridden downtowns at the latest. It is a matter of minutes with the Mobile.ForceM13.S1 -terrific! Clever: the Mobile.ForceM13.S1's fan is very easily accessible, since it is just mounted to the maintenance cover. Servicing-friendly: the Mobile.ForceM13.S1 features large covers at the bottom side for easy maintenance. The 1.3 MP webcam must not miss and allows for video-communication at home and also on the road for mobile usage. ... it also offers hotkeys for functions that are used often, besides two separate status-LED-units. Unfortunately, the LEDs themselves come off pretty small and are hard to read. Pleasant in terms of haptic and high-class in terms of look: the upper shell of the Mobile.ForceM13.S1 features a cool plate made of brushed aluminium. 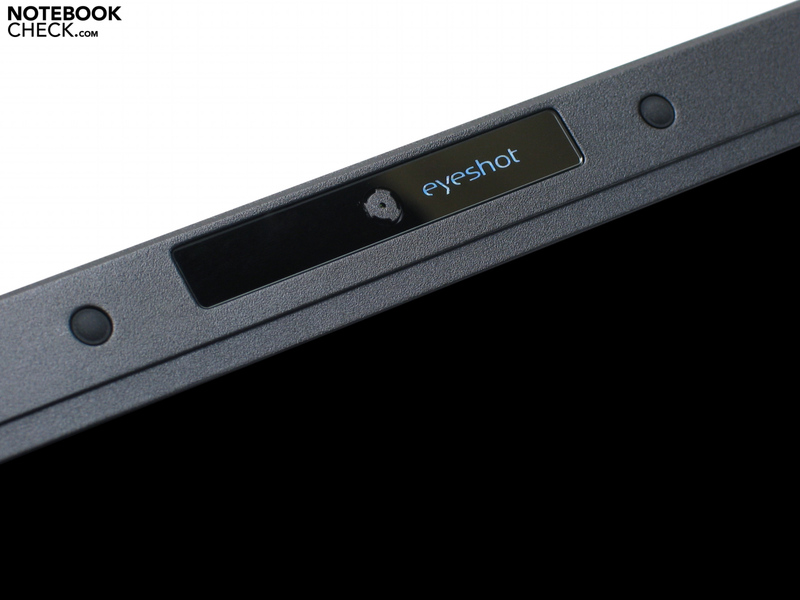 A fingerprint reader is integrated into the Mobile.ForceM13.S1 centrally into the touchpad as an additional detail of equipment. The Mobile.ForceM13.S1 does however not feature TPM for additional security. 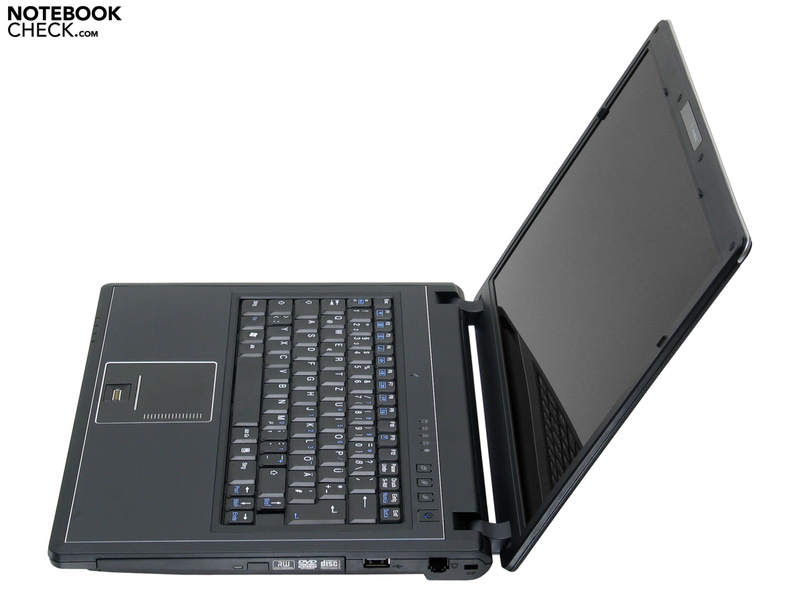 In spite of a weight of less than 2 kilograms, the Mobile.ForceM13.S1 features an optical drive (ODD). Remarkable: the chassis' stability apparently does not suffer, despite the ODD's drive bay. The Mobile.ForceM13.S1's look might seem a little stuffy to some, since it is plain-colored. For others, the plain, but classic dark coloring is exactly what accounts for the special charm. The Mobile.ForceM13.S1 features a very solid chassis and there is also nothing to complain about on the subnotebook as far as the built quality is concerned. The Mobile.ForceM13.S1 scores with the compact dimensions of the 13.3" class. 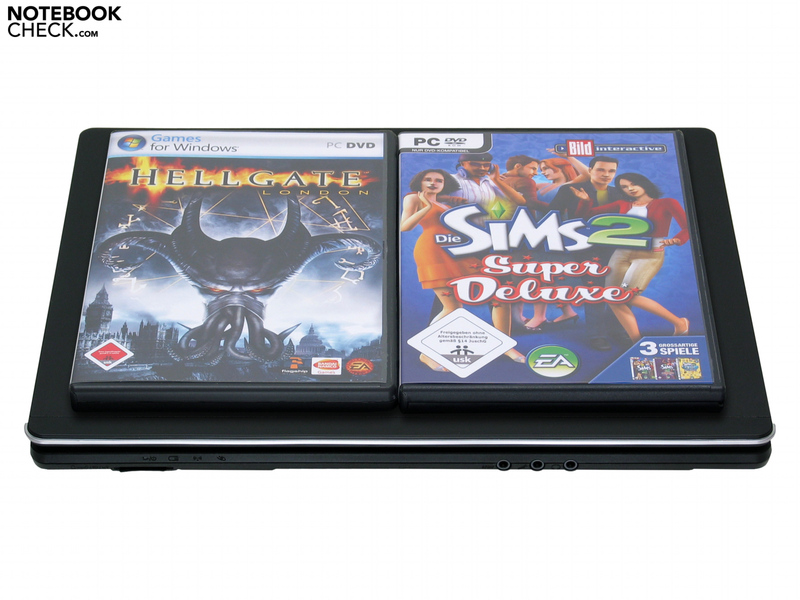 The subnotebook is only as wide as 2 game DVDs. 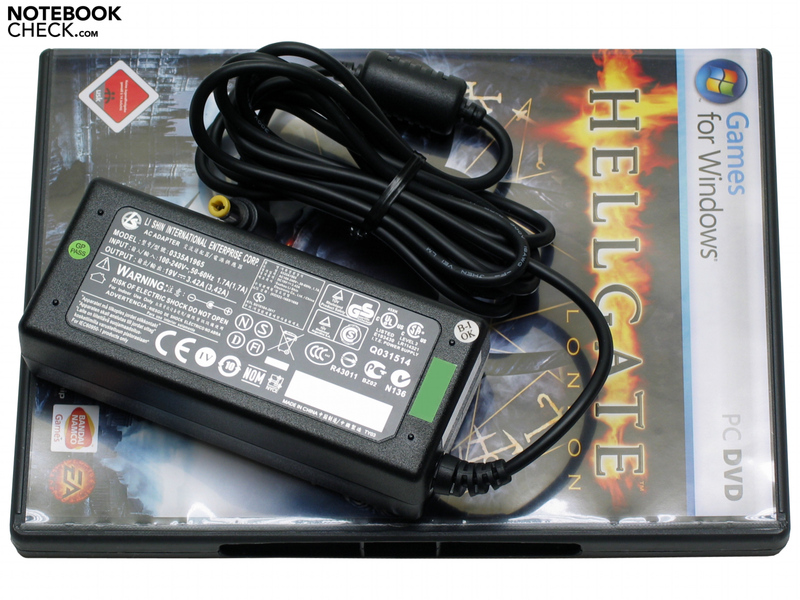 The power supply unit tips the scale at only 242 grams, it fits in every briefcase, and also quickly recharges the notebook battery. Clevo blundered at the battery: the Lithium-Ion battery is pretty weak at 2400 mAh and only allows for a maximum battery life of about 3 hours. A second battery is almost obligatory here. The weight of below 2 kilograms in spite of the optical drive. The chassis despite the lightweight construction, and the built quality is also alright. The flat LCD-lid is flashy and also comparatively stable. 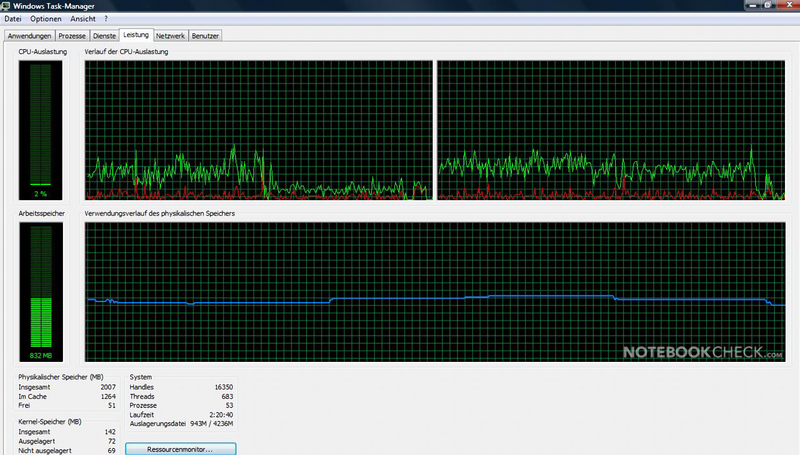 Working under Vista is also definitely more fun with the two core CPU than with a more languid CULV single core. The display is also really good, although it also reflects, albeit not as bad as it would without an additional anti-reflection coating. A more comfortable fan-control and a stronger battery. One can get over the battery, and just buy another one. But the fan-control... it would be desirable to finally see Clevo provide for more silence in the box right at the start of a series of models. A matt display with the same brilliant and bright display of images as that of the featured mirror, that would even be worth some Euros more. And what exactly does speak against some more color on the chassis? Quite a lot if netbooks or subnotebooks already integrate a HDMI port. The Mobile.ForceM13.S1 does not. 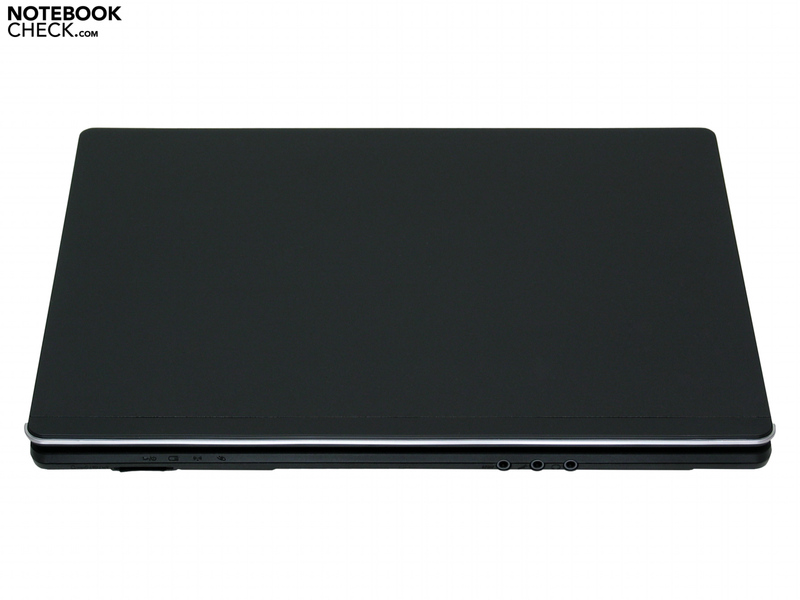 That the manufacturer Clevo only includes a feeble 4-cell battery with 2400 mAh for a 13.3" subnotebook. This does allow for saving some weight, but the mobility is curtailed due to the low battery life. There is an abundance of 13.3" subnotebooks at the moment. Among them are also many 'endurance runners', which should make life hard for the Mobile.ForceM13.S1. For instance the Acer Aspire 3810T or the Packard Bell EasyNote Butterfly s. In comparison, both do have a weaker overall performance though. Then there's the MSI X-Slim X340 starting at 800 Euros, or the Sony Vaio VGN-SR41M/S, and the LG P310 Camini.